Huffington Post founder and Thrive Global founder and CEO Arianna Huffington is clearly on a healthy living crusade, and there is no question that she is the ultimate Stronger Woman. She has published 15 books including 2016's "The Sleep Revolution: Transforming Your Life, One Night at a Time." Huffington also delivered the keynote at the BOLD Mindbody Conference in San Diego. LIVESTRONG traveled to New York City and met with Huffington to get her advice for anyone who wants to be a strong leader or simply to live a successful life of balance. How Does Huffington Advise That Leaders Handle Criticism? As a wildly successful and outspoken woman, Huffington has faced some intense scrutiny and criticism over the years. How does she handle it and how does she recommend other leaders deal with this? "One of the greatest skills of leadership is being unflappable," Huffington says. "Any time you do anything in the world, there's going to be criticism." 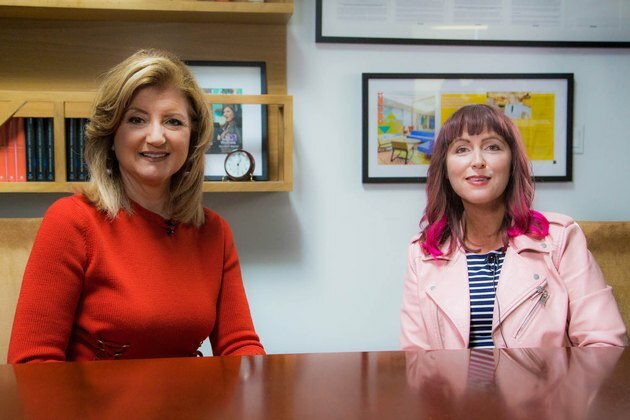 Huffington says she doesn't believe in growing a thick skin, instead she believes in listening to criticism and seeing if there is something valuable there that you can learn from. And, if not, she recommends staying on your course and moving forward for what your vision is for what you want to achieve. The number one piece of career advice Huffington has for female leaders is what they tell us on airplanes: "Put your own oxygen mask on first." Huffington says she thinks what women often do is put everything else first, and then put themselves last. "If you are running on empty, you are going to be less creative and less successful at everything you are doing," she says. "If you take the time to refuel yourself, then you'd be able to help everyone around you - whether at work or at home - from your abundance rather than from your emptiness." According to Huffington, we all need to be making sleep more of a priority. "I find that if I have enough sleep (which for me is 8 hours a night), and if I have taken time to meditate and to work out, I find this sets me up for the conditions for maximum creativity," Huffington explains. "If I'm running on empty and I'm just getting through my to-do list for the day, I find that I am much more transactional." Huffington says she sees the amount of suffering that is taking place in the world around the idea of being "always on," and she has created Thrive Global to try to change this. What advice would she offer to people who are younger, perhaps starting off in their careers? "Take care of yourself." Huffington says. "When you prioritize your own well-being, you will be more successful at everything you want to do." She also shares her favorite quote from Rumi: "Live life as though everything is rigged in your favor."